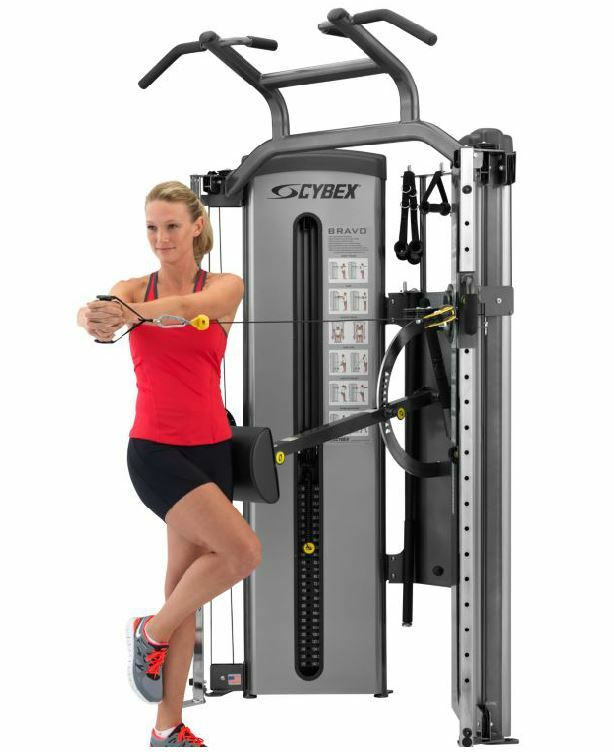 Machine Monday: Cybex Bravo All-In-One. In the last Machine Monday blog, we discussed how the Eagle NX Chest Press helps work the pectoralis major, anterior deltoids, triceps and biceps. With this Machine Monday we will continue to look at the chest press. However, we will look at performing the chest press exercise while using the Cybex Bravo All-In-One. In particular we will focus on how the Progressive Stabilization pad – which is unique to the Cybex Bravo - aids in performing a chest press exercise and allows for the user to train additional muscle groups. Traditional functional trainers only allow for a free standing option for their cable based machine. In the free standing position, the user has to lean forward in order to maintain balance. As a result, the user is limited in the amount of weight he or she can lift. However, by using the progressive stabilization pad the user can lift a much greater load. The user is no longer required to use their muscles primarily for maintaining balance. Instead, the pad provides the necessary balance and thus the user can focus on using the pad to surpass the muscle-building limitations of a traditional machine. While the free standing position is not a bad choice, it inherently limits the amount of weight the user can lift because there is no stabilization. Indeed, the user is unable to lift more than 40% of their body weight. This limits the user’s ability to build strength and instead only allows for challenging muscular endurance. However, if one wishes to progress in their training and build strength, then using the Bravo's progressive stabilization bar is a better choice. In the partially stabilized position, the pad is placed at the top of the pelvis and the user stands upright. The user actually brings the abdominal muscles to work in addition to engaging the pectoralis major, anterior deltoids and triceps. While many trainers believe that free standing (no stabilization) brings the abdominals to work, the research of David Peckinpaugh Strength Gains From a Partially Supported vs. Free Standing Position Using a Cable Resistance Machine indicates this is not so. In fact, by using partial stabilization the user gets 184% greater activation of the abdominals than with full stabilization or no stabilization at all. With both the partially and fully stabilized position, the user can also lift a 212% greater load than in the free standing position. This allows for a much faster increase in muscular strength. The user is targeting the muscles in a much more effective way than with the free standing position. Do you want to see how to put these facts to work? Ben Wilde, Cybex International Training and Education Director, provides instruction on how to use the various modes of the Bravo All-In-One to perform a chest press. As you will see, differences in stabilization increase the training of different muscle groups. Free Standing Chest Press – This is the traditional method of using a functional trainer. Here, the pectoralis major muscles are engaged. The challenge in this exercise is to maintain one’s balance. Fully Stabilized Chest Press - Here, the bar is placed in line with the shoulder blade. The bar provides the balance for the athlete. The exercise here is similar to a traditional chest press or bench press. This position allows for the user to lift a 212% greater load. Partially Stabilized Chest Press - This exercise is perhaps the most unique position of the progressive stabilization bar. Again, the bar provides the necessary stabilization. Ben demonstrates how the user’s abdominals are engaged in this exercise in addition to the muscles traditionally engaged by the chest press. It is important when training the pectoralis major and related muscles exercised in the chest press to also train the muscles’ antagonists. Failure to do so will likely result in a muscle imbalance and alter the mechanics of the joints involved. In the case of the chest press, the antagonists are the posterior deltoids and latissimus dorsi. To train these later muscles, one should try row exercise which can also be performed on the Bravo. Next time you are looking for a new way to exercise your chest muscles, you should definitely give the Bravo a try. You can try all three positions as each is challenging different muscles in different ways. Your goals should dictate how you choose to use the machine.